Consider the following list when things might not be going too well, and remember, you are not a veteran teacher just yet, although you play your part in the war. I mention ‘Teacher Training’ a lot. I do this because I can’t substantiate the claim that there is any difference between a Certificate in Education (Cert-Ed) and a Post-Graduate Certificate in Education (The infamous PGCE). We’re all in the same boat when we start teaching, degree or no degree. Yes I know that one is technically a higher level qual… but so what. Same training, therefore same name in my articles. Don’t like it? Write your own. If you want to discuss this, feel free to get in touch. My purpose in writing this is not entirely certain. I think I might be trying to validate some feelings I am having at the moment. I think that I am aiming to inform others of what the highlights and pitfalls of being a newly qualified teacher really are. No matter how up to date your training is, there is always someone in the office who knows better. These people are not always right about what they say. Almost everyone who’s on your teaching team, and your managers, are not as up to date as you are in terms of hitting the points that OFSTED and the quality and assurance team require. You’ve just done a course that trains you perfectly to hit these criteria. Take it in your stride. Don’t always do what you are told unless it’s a manager saying it – someone suggesting that you should use this lesson plan or this assignment brief template is not necessarily saving you work. Do your own research to answer your own questions, and never start anything without checking it with a manager beforehand. One question leading to a two minute discussion could save you several hours of work – time non of us have going spare in our line of work. If you are still in training or perhaps still very new to your position, make it known among the staff. This will allow you perhaps a little more slack with the horrendous systems mentioned in point 2… despite the fact that you are actually as well prepared as the rest. If you want to understand why I say the above, keep reading. I will denote each relevant point with the number from above. (5.) Be wary of what others say is the best thing to do. If you are under as much scrutiny as I was, you’ll know that your lesson plans are being SPAG’d and you are being watched like a hawk. Doing anything other than what you are told, trained and allowed to do is likely to lead to a bumpy ride. Example: CPD day 1 of the year. 5 minute lesson plans (see my post on this) were officially sanctioned, OK’d, thumbs up, OFSTED-will-allow-it’d. Hats and wigs thrown in the air by all, the jubilation, the cries of delight! No longer do we have to bring half a tree to each lesson and type for hours just to explain how we do our jobs on a minute by minute basis! Joy! One caveat on that statement however; the Schemes of Work need to be bulletproof, have most of the detail and links between lessons need to be clear. They need to read like a Steven King novel. Me being me, I privately asked my manager, and the quality assurance staff if these lesson plans were actually going to be allowed (even just within our department). I was told that ‘if OFSTED are really OK with it, then go ahead’. I searched the internet briefly and realised quickly why there are so few people pushing for this to become the status quo. The reason is largely down to bad design. Bad design looks unprofessional, therefore most of us give it a miss. 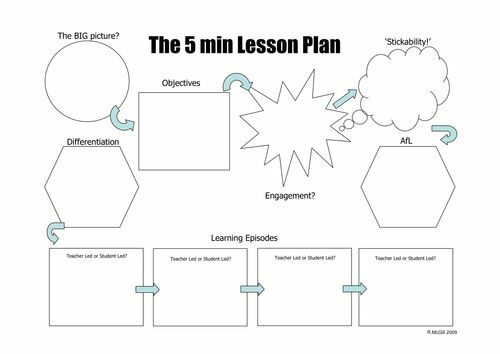 This abomination is what you might call a 5 minute lesson plan. A filled out lesson plan, filled out using Photoshop. If you don’t have Photoshop, just print it and use a pen! (1,3 & 4). You are the freshest greenhorn there is, despite your mentors guidance and your preparedness for the workplace. The workplace could be a daunting minefield. You are the only one with a detector powerful enough to allow you to tread carefully. To put this in context, I was partaking in a CPD (Continuing Professional Development) seminar one day. We all deal with kids who speak out of turn, are rude, talk over us whilst we are teaching. Nothing changes for a group of any age. I was (to a certain degree) enjoying the session, it was easy for me as I was still fresh with ideas and knowledge from my teacher training. From the back, just at the start of the session in the afternoon (after the lunch the department laid on for us, which was nice) I hear one of the ‘older’ staff, winging ‘We shouldn’t have to do this it’s like being in school again’. She didn’t return after the first short break, having signed her name on the sheet that would in turn get her the full afternoons pay. This mentality is clearly subversive, yet all too common. The aim of the session isn’t important, it’s the fact that she had already shut her eyes and ears to what was going on; free inspiration, free ideas, free lunch to boot. I hasten to add at this point that whilst I was getting 1’s & 2’s in my official observations (of which there were three over the first term, the first being a ‘supportive’ observation that wasn’t technically counted), she was getting a string of 4’s and was subsequently relieved of her post. Mid year. Despite the disruption, the students evidently were better off being taught by the learning support assistant for the following four weeks whilst the college sorted out a replacement. (2, 6). If you land your first job in the place you trained in, then that’s wonderful, well done you. This gives you a leg up for the first time in your teaching career. But, if you switched institution, then let your new team know that you don’t know their systems. Sometimes this may be best said even if you do know their systems. Tell them you don’t know where room xyz1.2 is, you’ve only been on site for a matter of a few weeks. Ask them if any equipment is faulty, and ask them how to log a fault or request replacement parts. All of these things are easily and commonly overlooked when doing your training. With all the essays you have to write and the observations you have to plan for, you are not seeing the entire spectrum of what a teaching position will throw at you. Your mentor is doing all of these things in the background, and as time goes on it becomes invisible. Suddenly, when you have the job yourself, something that you felt you know, there are all these annoying tiddly tasks that for some reason take up 70% of your time all of a sudden. Finding out how to do the small things will help hugely in the long run. Also, for those of you reading who are currently doing teacher training, use these small things as action points in your ILP (Individual Learning Plan). It’s free brownie points for you to write up and they could be the key to getting a high(er) grade in your qualification, which is tough as nails to do as it is. I wish I had thought of doing it myself at the time. There are obviously countless comments that could be made about the pay we get as teachers. If you have a permanent position, you know the subject area, can handle the report writing and system information updates, assignment writing and marking you have to do… stick with it. You will find the second year somewhat easier. If you are working part time, do just that. Work part time. Don’t do what I’ve done and take on additional hours that are not truly filling up the remaining days in the week. Before long you will find that you are working most of a week for a fraction of the pay. For the long term, additional hours are harmful to your career. You are thought of as the ‘teacher who helped fill out the timetable’ for about a month, then this disappears and it’s the new norm. Instead of being paid for a normal, 8 hour day, you are being paid for the couple of teaching hours, and some prep time (which never, ever amounts to the time you actually spend). The stress that comes with knowing every hour you work these hours will not equal the value they bring to your bank account. There is a reason that teachers have second jobs and do after hours tuition. Just think on that before you commit. It’s just not equitable, especially when it comes to the term breaks… your pay will fluctuate and you’ll soon forget yourself that your paycheck isn’t as stable as you had hoped. Then, HR don’t add the hours one month and you end up in the red at the bank. I don’t mean to put anyone off teaching, the first steps in any job are tough, have learning curves, trials and tribulations. Thanks for reading.